Desserts are my thing, I have absolutely no shame in admitting that I love a good dessert. 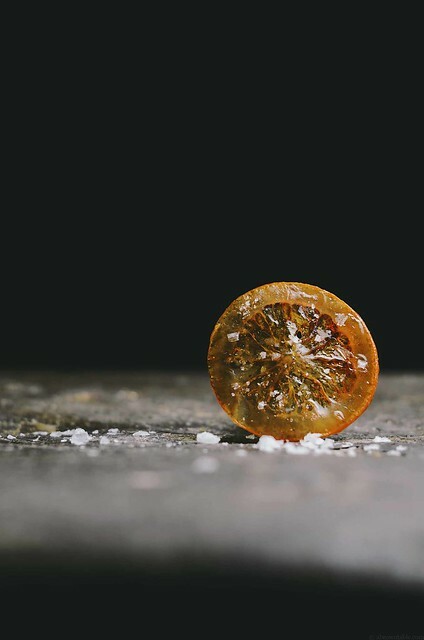 But sometimes, the little garnishes that go on top of desserts are worth the same or even more attention that the actual finished sweet treat gets. Garnishes are what make food stand out and I honestly don't think I've done enough justice to them on this blog. 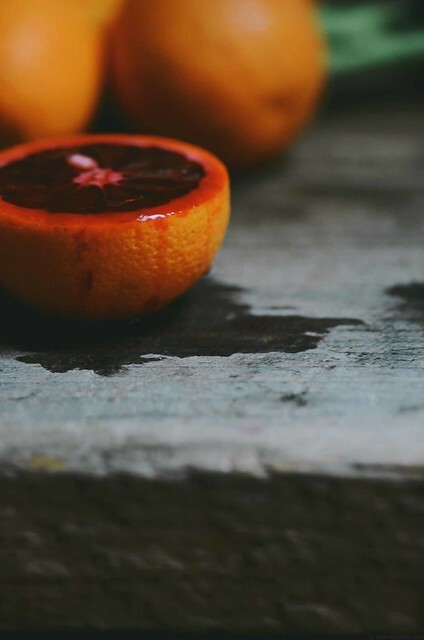 So in this post, I'm going to share one of my favorite garnishes made from one of my favorite fruits, oranges. 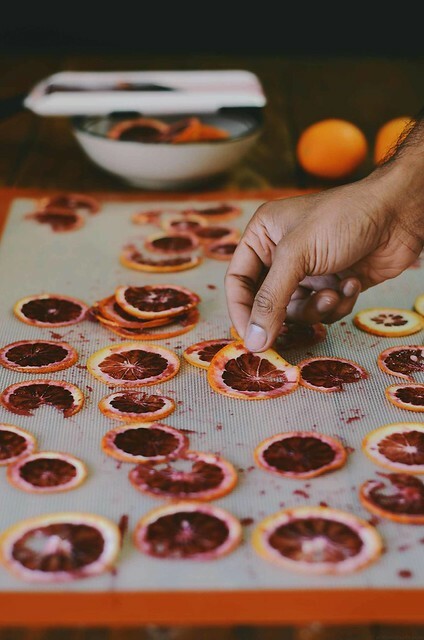 Since we've been fortunate to come across a bounty of blood oranges, I used them in this recipe but regular oranges and for that matter any type of citrus fruit like lemons, grapefruits or limes will be perfect here. 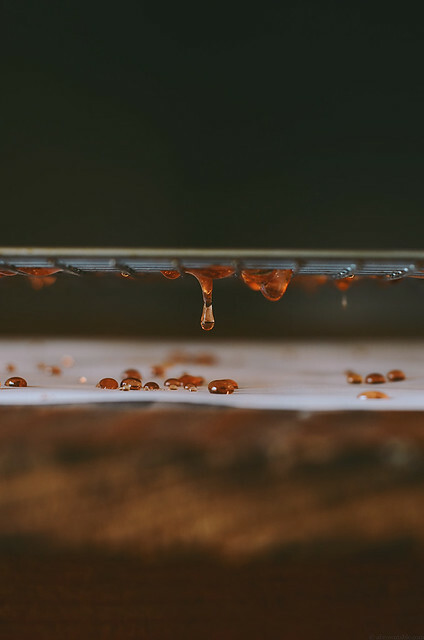 Also, the left over sugar syrup that becomes a dark golden orange and fennel flavored glaze makes the perfect sweetener to add to drinks or tea. 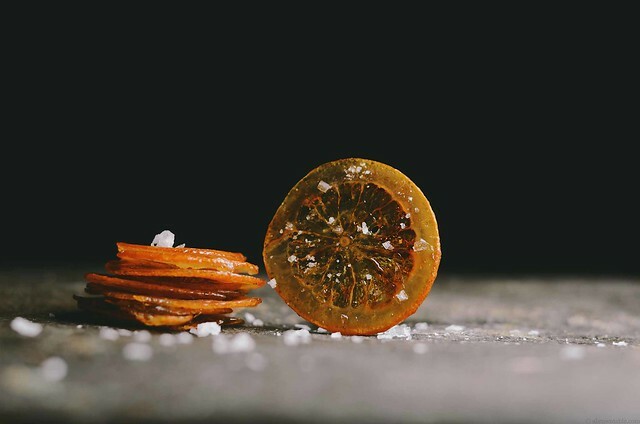 Each orange slice is infused with a simple syrup flavored with a light hint of fennel and then sprinkled with a little Maldon sea salt to make a delicious little slice packed with sweet and salty flavors. This recipe should work for any kind of citrus fruit that you want to candy such as lemons, oranges, grapefruits, limes, etc. Scrub and wash the surface of the oranges well before slicing them to get rid of any grit or dust. A mandolin works great to get slices of uniform thickness and I used the lowest setting on my handheld Oxo Mandoline . I also used different sized slices because they will be tasty in the end. You don't want to cut the slices to thin or they will break while you handle them. 1. 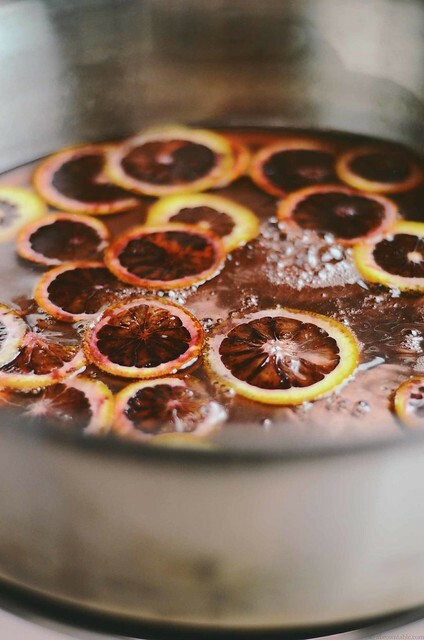 Place the water and sugar together in a large thick bottomed saucepan with a lid(the more surface area the better, you want it wide enough to fit all of your orange slices in a single layer, I used a 12 inch diameter saucepan). Place the coarsely cracked fennel seeds in a spice bag and tie the bag up. Place the bag in the saucepan and bring the contents of the pan to a boil on medium high heat. Boil the liquid for 1 minute and reduce to a gentle simmer. 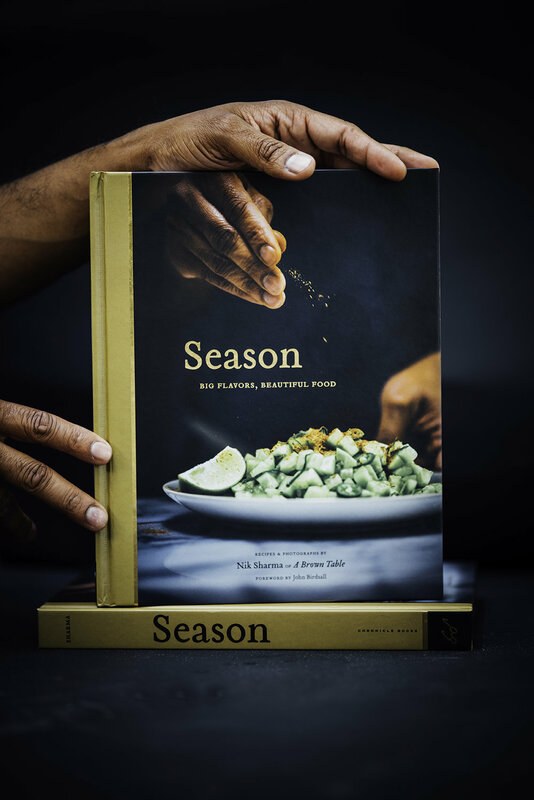 Remove the spice bag and discard the fennel. 2. Switch off the heat. 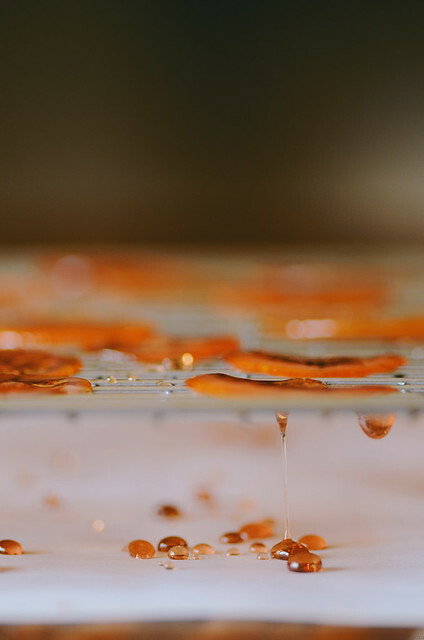 Place the orange slices over the surface of the sugar syrup in the pan. Carefully, dunk each slice into the syrup using a spoon to wet the entire slice of fruit. Cover the pan with a lid and cook the liquid on low heat to keep it barely simmering. Let the fruit cook for 1 hour. About half way through the cooking process, open to check and make sure the orange slices are immersed in the syrup, if the liquid levels are low, add about 1/2 cup water. The slices will be done after an hour when they become completely transparent. The syrup will acquire a golden color as it cooks but shouldn't burn. 4. Place a wire rack in the center of the oven and preheat to 200F. Randomly sprinkle the maldon sea salt flakes over the chips. Place the entire rack with the orange slices and the baking sheet in the oven and keep the oven closed for 20 minutes, then switch the oven off and allow the chips to stay in the oven for another 40 minutes. Remove the entire rack with the orange chips from the oven, they should crisp. Carefully peel the chips from the wire rack and store each chip between sheets of parchment paper, placed in an airtight container. If the chips get sticky you can always dry them up a little by placing them in an oven that is preheated to 200F, switch the oven off as soon as you place the chips in and shut the door for 10-15 minutes. The chips will be crisp and ready to use.